Who was Harrison William Weir? An artist, an illustrator, a journalist and author, a poet, a champion of animal rights, a poultry-man, an ornithologist, a horticulturalist and naturalist…a dog lover, a cat lover, a horse lover, a friend to all bird-life, a friend to farm animals…these are just some of the many titles and attributes that come to mind when answering the above question. He is officially acknowledged as the “Father of the Cat Fancy” due to his key role in the establishment of cat shows, but he was indeed much more. His chief claim to fame was being widely acknowledged as one of the leading illustrators of the Victorian era, especially where bird or animal life was the subject matter. In fact, in this field he held a pre-eminent position, both in Britain and around the world. His work appeared in a large variety of periodicals and in a growing range of children’s books and magazines published on both sides of the Atlantic. His exceptional artistic skills, coupled with extraordinarily keen powers of observation and a benevolent attitude towards animals, helped to educate and influence several generations of young people across the globe. It was his very natural portrayal of examples of both the generosity and sagacity of animals in real life situations, which contributed to a significant change in Victorian perceptions towards their humane treatment. 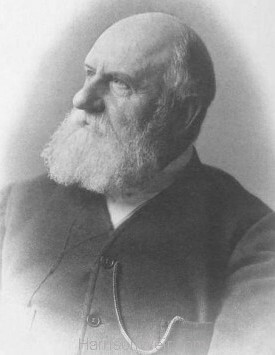 By 1877, more than five million copies of his illustrations were being circulated annually. Both his interests and illustrative subject matter was in fact so broad, that in a very real sense he was an artist for all ages. ..that Harrison Weir was engaged as a designer, by the famous firm of Silversmiths, “Garrards” of London; and over a period of thirty years designed many racing trophies for famous events such as “Ascot” and the “Goodwood” Races. The image immediately to the right, is one of his designs for the “Steward’s Cup”, a trophy presented as part of the annual Goodwood Races, of 1865. This image is from an engraving of the trophy published in the Illustrated London News. It is a depiction of Robin Hood, sounding the horn after the successful conclusion of a deer hunt. The image to the far right, is of the White Horse of Kilburn. This huge chalk image, created high on a hillside near Kilburn in North Yorkshire, sits on a base of grey limey sandstone. It was the brainchild of landowner Thomas Taylor, who had seen similar large figures on hillsides in southern England. Determined to have one near his home town of Kilburn, he commissioned Harrison Weir, to create a design specifically for this purpose. The horse was completed in November 1857. The Steward’s Cup, a design by Harrison Weir for the Goodwood Races of 1865. Engraving from: The Illustrated London News. 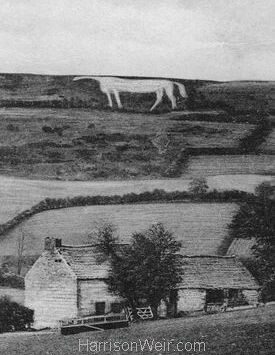 The brainchild of Thomas Taylor, the White Horse of Kilburn was created from an original design by Harrison Weir. Books “O5” and “O9” from the Vere Foster series of Drawing Copy Books themed on “Animals”. Eliza Cook already had an established international reputation as a successful poet, journalist and editor by the time Harrison Weir was beginning to be recognised as a new force in the world of book illustrating. 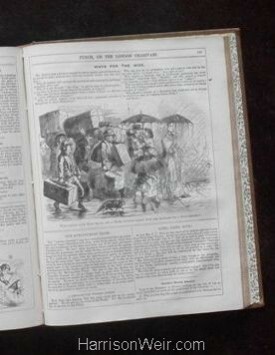 Several volumes of her poems contain images by him, such as that which illustrates her poem ‘Old Dobbin”. But we have the writer and and Gunsmith, William Harnett Blanch to thank for enlightening us through his book, “Ye Parish of Camerwell” (Camberwell), that in fact Harrison Weir and Eliza Cook lived directly opposite each other on Lyndhurst Rd. No doubt the two would have socialized and been on neighbourly terms, and when needed, commissions for illustrations would have been easily negotiated. We are also fortunate to have in our collection, an autograph letter from Harrison Weir to William Harnett Blanch. The steel plate engraving to the right, is a fine portrait of Eliza Cook. The above books represent just two from a series of 12 Drawing Copy-books, the brainchild of leading Irish educator, Vere Foster. Harrison Weir was one of a number of artists chosen to contribute to this particular series on “birds and animals” and in fact, by far the majority of the drawings included in them, are by him, and in some cases, all. The booklets were designed to directly engage the children in artistic endeavour. Children with obvious talent were quickly identified and encouraged to pursue their passion and/or turn it into a possible career path. 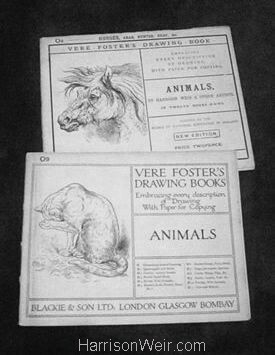 Weir’s reputation as an animal illustrator was already well established, but with these books, many tens of thousands of school children brought these examples of his work directly into their homes. We are fortunate to have 6 of the 12 booklets in our collection and are pleased to be able to make almost all the images within them available through this site. 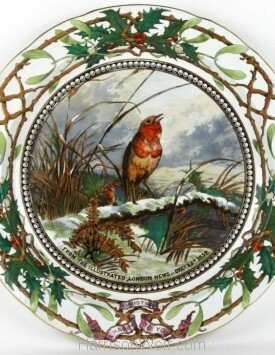 A Copeland Spode Christmas Platter, using the design by Harrison Weir, produced circa 1861.